Once was John Carney’s acoustic set, aching with melancholy and subtlety, while Begin Again was his attempt to crack the US Billboard charts, same template but with slighly bigger speakers and razzmatazz. He rounds off his trilogy of musical dramedy with the best of the lot; a coming of age, nostalgic, foot tapping charmer, that will appeal to Directioners and Dexys Midnight Runners alike. It’s that age-old story of boy meets girl, boy falls in love with girl, boy starts a band to impress girl. Our lead singer is Cosmo (Ferdia Walsh-Peelo), a young man at the center of a fractured family life in 1980’s Dublin. For financial reasons he has had to relocate to a Catholic school on Sing Street, where he has the wrong colour shoes, and a level of intelligence which marks him out for some knuckle dusting treatment from the bullies. It’s on a saunter home that he spies his would-be muse, Raphina (Lucy Boynton), all eye shadow, MTV big-haired and mysterious, and propelled by the frustration of another day of blackboard hardships decides to ask for her number, something she agrees to based on his fib that he’s in a band. So with her number on his homework diary, and the guidance of his stay-at-home brother (Jack Reynor), Cosmo sets out to sync himself with the music and styles of his generation, and let the children boogie. Sing Street finds Carney returning to a more grounded stage after the Hollywood cliches of Begin Again. This is seeped in the nostalgia of Adam Ant make-up, peroxide blonde fringes, and terrible lounge room wallpaper, but more pertinently is about friendship, family, and the stomach butterflies of young love. In that respect, the movie never misses a beat. The young cast are absolutely terrific; holding a tune as well as turning in performances that are equally comedic and dramatic. Walsh-Peelo carries off the insecurities of searching for an identity in a world without male role models, but also convinces as a burgeoning lead singer and wanabee new romantic. Props also to the script for making Boynton more than just a girl who loves boys. She has a backstory that runs parallel with Cosmo’s desire to be something more, and the young actress gives her character an emotional depth that too many films would simply treat as a plot device. Like most great albums, there are too many wonderful things to appreciate, with the kids sharing an instant chemistry, but there is an exchange between Cosmo and his best-chum in the band, Eamon (Mark McKenna) where he knocks on his door to ask if he wants to write a song with him, to which Eamon replies “always”. 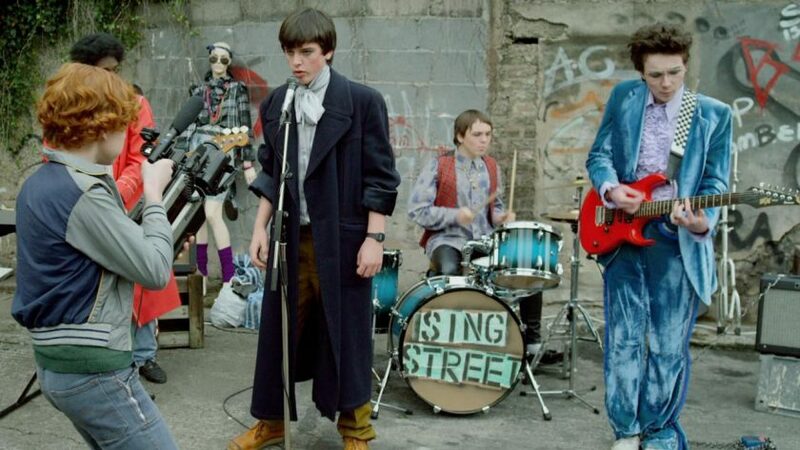 It’s one of those eye-moistening moments that perfectly captures the naivety of youth, something Sing Street does repeatedly. As with Begin Again, there are songs that’ll be hummable on the journey home, with ‘Girls’ the infectious footstomper, and ‘The Riddle of the Model’ the smile inducing pop homage. This is one boy band you won’t be ashamed to listen to. Things become a little unrestrained by the time we reach the all-too-silly, but fist pumpingly fun finale, but only the hardest of hearts would begrudge a film imbued with joy from having its John Hughes moment.